We have reached Week 8 of the high school football season. This is the second week of district play for the majority of the classifications where we will begin to see teams qualify for the playoffs. We have already crowned several district champions in the small classifications as district play continues. This is the point in the season where the focus should shift from these rankings to district standings and potential playoff scenarios. But the rankings are too much fun to speculate upon, so here is this week’s top five polls. As always, check out the complete polls along with recaps of the team’s game from last week on our Rankings page. One week after being upset by Shawnee Heights and falling form the 6A rankings, Topeka High rebounded with a 52-41 win over No. 5 Manhattan. It was the Trojans first win over the Indians since 1998 and as a result, it bounces Manhattan from this week’s 6A poll. Topeka moves back in at No. 5 this week, while the rest of the poll remains in place. The big match-up this week will feature No. 4 Olathe South at No. 3 Blue Valley in a game that will likely decide the District 3 title. Is there anyone in Class 5A that can challenge Bishop Carroll? It doesn’t look like it thus far. The top-ranked Golden Eagles blasted Maize 69-7 last week and will face Maize South (6-1) this week. St. Thomas Aquinas moves up from No. 4 to No. 2 this week after a 48-7 win over Blue Valley Southwest. The Saints jumped No. 3 Salina South, which remains stable at No. 3 after a 14-7 win over rival Salina Central. Wichita Heights moves up one spot to No. 4 this week after a 42-13 road win over Andover, and Blue Valley West re-enters the poll at No. 5 after pulling out a 14-12 road win at last week’s No. 2 Pittsburg. The Purple Dragons fall out of the top five this week as they will likely need to beat Blue Valley Southwest and win at No. 2 St. Thomas Aquinas to qualify for a playoff spot. While many expected the ranked showdown between Hays and Buhler to be a close, high-scoring battle, only one of those things came true. Buhler put up 55 points in routing the Indians 55-21 behind nearly 490 yards of total offense from junior quarterback Jace Williams. As a result, Buhler moves up to No. 3 in this week’s poll, while Hays falls to No. 5. KC Piper posted a big win over Basehor-Linwood and moves up to No. 4 this week, while Topeka Hayden is up one spot to No.2 after beating Andover Central, 51-21. Bishop Miege remains on top after a 42-0 shutout of Spring Hill. Another week passes without changes in the 4A, Division II poll. Top-ranked Andale cruised to a 49-28 win over Wichita Trinity while the remainder of the top five posted comfortable wins. This week, No. 3 Columbus hosts No. 4 Frontenac to decide the CNC League title and District 4 championship. 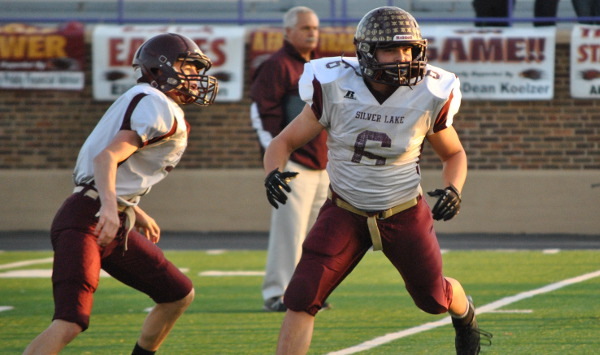 In Class 3A, top-ranked Silver Lake and No. 2 Rossville each topped the 75-point mark in opening district play with dominating wins. Silver Lake shutout Osage City 79-0 and Rossville handled Oskaloosa, 77-8. Scott City shutout Southwestern Heights 49-0 and remains at No. 3, while No. 4 Conway Springs battled past Cheney, 35-19. Wichita Collegiate remains ranked fifth this week after blanking Leon-Bluestem, 55-0. The top five in Class 2-1A also remains unchanged this week despite a showdown of ranked teams last Friday. Third-ranked Olpe scored with 2:41 remaining in the game to top No. 5 Lyndon 36-28 and both team remain in their respective spots this week. Top-ranked Phillipsburg and second-ranked La Crosse cruised to wins, while No. 4 Meade scored with 1:12 remaining and got a late interception to hold off Marion, 39-36. In Eight-Man, Division I, all five teams cruised to blowout wins with the closest margin being No.2 Osborne’s 52-6 win over St. Francis. Top-ranked Hanover and Osborne appear to be on a collision course for their Week 9 showdown, although Osborne could get tested by high-scoring Wakefield this week. The big game on this week’s slate features No. 4 Spearville traveling to No. 5 Hodgeman County in a key game in District 7. Finally the Eight-Man, Division II rankings and playoff picture are becoming clearer each week. While No. 1 Chetopa continues to walk through their district schedule, No. 2 Victoria has passed major tests in beating Beloit St. John’s-Tipton and Thunder Ridge. Last week, the Knights bested Thunder Ridge 58-34. As a result, the Longhorns dropped one spot to No. 4 this week, while St. John’s-Tipton remains at No. 5. Sharon Springs-Wallace County moves up a spot to No. 3 this week after an easy 62-0 win over Golden Plains.